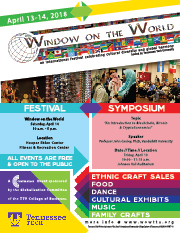 Window on the World is an international festival celebrating international culture and harmony. All participants are invited to share in learning and caring about our world and its people. Admission to WOW is free. There are varying costs for vendor items and food. WOW is funded primarily by Center Stage and sponsored by the Globalization Committee of the College of Business. Join us in the Spring for WOW 2018! Symposium - Friday, April 13 from 10:00-11:15 a.m. in the Johnson Hall Auditorium on TTU campus. Festival - Saturday, April 14 from 10:00 a.m. - 5:00 p.m. in the Hooper Eblen Center and Fitness Center on TTU campus. Professors, students and community leaders serve on this committee to organize the festival each year and make WOW a successful event. Vickie Copeland – International Education Admin.